If you want to go out on fishing along or are seeking a good company for the same, then shared charters in Miami, Florida are suitable for you. We offer shared charters that enable the people to book a fishing boat trip at fraction of prices. The interested individuals need to book 1 to 2 weeks prior to their trip to make sure that charter leaves on time. The charter leaves when there are at least four guests that are interested for fishing. If there are only three individuals, then they can split the amount of the fourth person among them. It is a good option to meet new people while on an adventurous trip. The targets on fishes are hitting to ensure each individual gets equal change to reel in the best catch. To catch sport fish, the company relies on trolling. The fishing begins with ballyhoos and continues to the county wrecks, which is followed slow trolling for bigger catches. During these journeys, the group catches cobias, barracudas, golden amber jacks, marlin, tunas, mutton snappers, and permits. You might also catch giant troupers during these journeys. 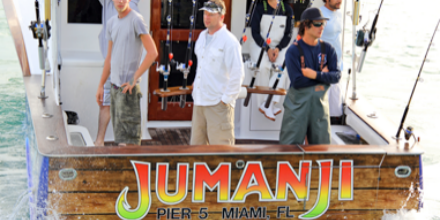 If private charter is what you are seeking for sea fishing in Miami, then also you can contact us. We have affordable charters with capacity of 20 passengers. 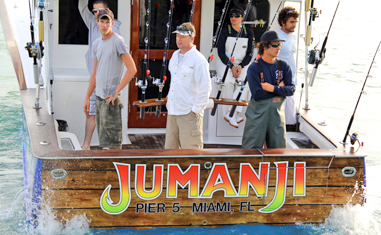 Learn more about our charter solutions from here: fishjumanji.com. You can inquire about the prices, availability and other stuff by filling the form on our website. Or, simply call us at this number: (786)486-7200.